It's been a little while since I've had a weekly feature on this blog, following the final instalment of Furuba Fridays back in April last year. As I mentioned in August, I've had to abandon or strip back a lot of the features I used to do on this blog in order to concentrate on both my job and my ongoing journalistic training. 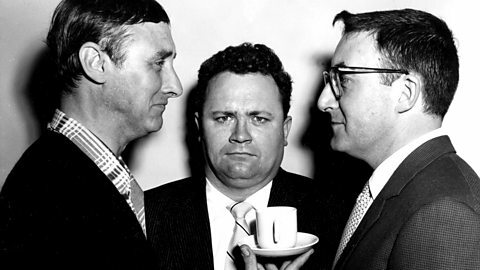 But now I feel the moment is right to do another regular feature, at least for a little while - and that brings us to The Goon Show Guide. 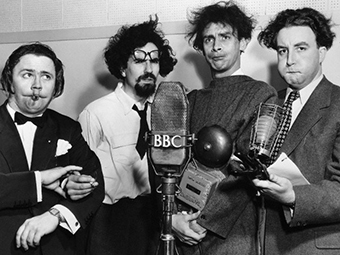 I've made no secret in the past that I am a huge fan of The Goon Show. Having been vaguely familiar with the show during my teenage years, I became a compulsive fan from my first year as a student. My Mumbling On co-host Thomas Wales introduced me to a lot of the episodes and characters which are now my favourites, and there is an awful lot of The Goons in The Yesterday Show and particularly its sequel, The Adventures of Battenberg and Schnepps. My subsequent friendship with Peter Byrom further expanded my interest, leading me to accumulate all the episodes I could find. I've already declared my love for the series in various posts on this blog, from my Blog Spot on fansite TheGoonShow.net to this Letter of Note about Peter Sellers urging Spike Milligan to revive the show in 1980. But I think the time is right for me to go into a bit more detail about the series, going through some of my favourite episodes in detail and recommending the few bad apples that you should avoid. That's what I intend to do with The Goon Show Guide. Every Wednesday evening I'll be going through a set of episodes, usually a series a week, and summarising each episode in turn. Even though the episodes are the same length (or thereabouts) as the Fruits Basket Radio Drama I covered before, there's simply too many of them to do one a week: you would quickly get bored and I would quickly run out of things to say. I'll also indicate where you can purchase the shows for yourselves, share interesting stories about the making of the series, and point out where the shows may have directly influenced the comedians who came after them. Yes yes yes yes yes! Another Goon-type CraZy... welcome steaming friend.